Description:Geese in Flight stands 110 ft (33.5m) tall, is 154 ft (46.9m) wide and weighs 157,659 lb (71,512.91 kg) and it is still listed on the Guinness Website. (visit link) The sun burst is made of over 300 lengths of well pipe and there is more than 4.4 miles of weld holding the sculpture together. 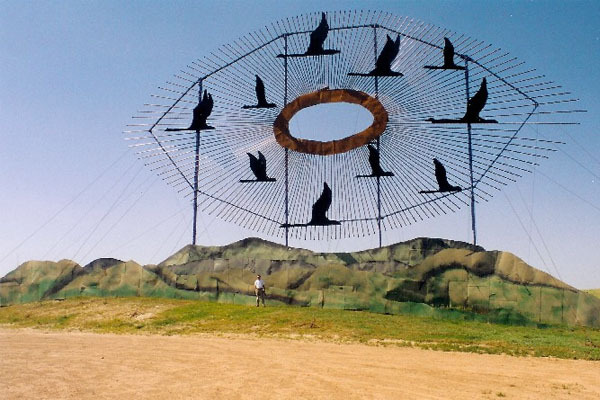 The geese and the fake hills below the sunburst were made from 12 oil well tanks that were taken apart and welded back together to form the shapes.